These are a bit unique and fun to eat. 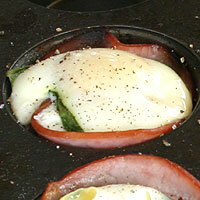 I gave a basic ham, spinach, cheddar, and egg recipe, but I'm sure there are a lot of good combinations. 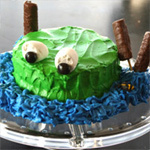 Have fun experimenting! 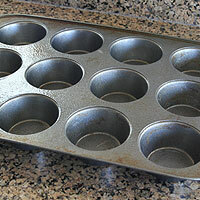 Spray a muffin tin with cooking spray. Line each slot with one piece of ham. Line each slot with one piece of ham. 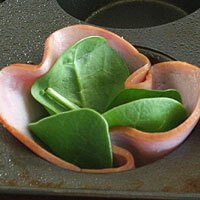 Line each piece of ham with 3-5 spinach leaves with the stem on the bottom. If you have very large pieces of ham, cut them to fit. 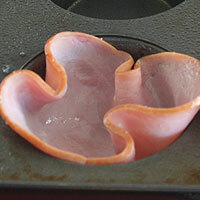 If the ham is too small, don't use the whole egg, or it will spill down the sides and be a mess. 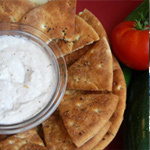 Sprinkle a teaspoon or two of cheese in the bottom of each. Crack one egg in the middle of each. Do not salt and pepper at this point or it will form a plastic-like layer on top. Tent a piece of foil over the top so it's not touching the eggs. Bake at 350 for 30 minutes. Remove foil. Salt and pepper immediately. 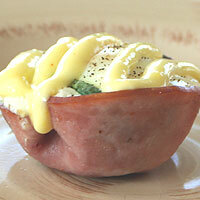 Remove from muffin tin by gently lifting sides of ham and place on serving dish. Drizzle hollandaise over the top of each. Serve warm. Don't forget to spray the pan or the ham will stick strongly to it. I once prepped these ahead of time and refrigerated them, but the spinach gave it an off flavor. If you don't use the spinach you might be ok to make it ahead. Be careful when you crack the egg into the ham. It will of course still taste great if a little egg spills. I just won't look as good. Be sure to foil the top or the ham will burn on the edges. Don't salt and pepper before baking, it toughens the top. 1. Preheat oven to 350. 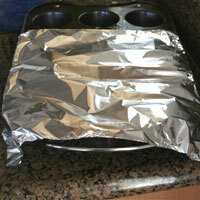 Spray a muffin tin with cooking spray. Line each slot with one piece of (1)ham. 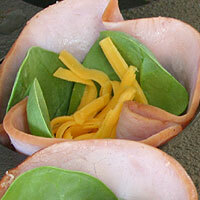 Line each piece of ham with 4-6 spinach leaves with the stem on the bottom. 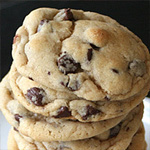 Sprinkle a teaspoon or two of cheese in the bottom of each. Crack one egg in the middle of each. Do not salt and pepper at this point or it will form a plastic-like layer on top. Tent a piece of foil over the top so it's not touching the eggs. 2. Bake at 350 for 30 minutes. Remove foil. Salt and pepper immediately. 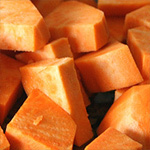 Remove from muffin tin by gently lifting sides of ham and place on serving dish. Drizzle hollandaise over the top of each. Serve warm. 1. If you have very large pieces of ham, cut them to fit. 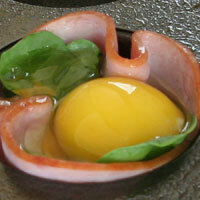 If the ham is too small, don't use the whole egg, or it will spill down the sides and be a mess.